Ronnie Gilbert had a long and colorful career as a singer, actor, playwright, therapist, and independent woman. Her lifelong work for political and social change was central to her role as a performer. 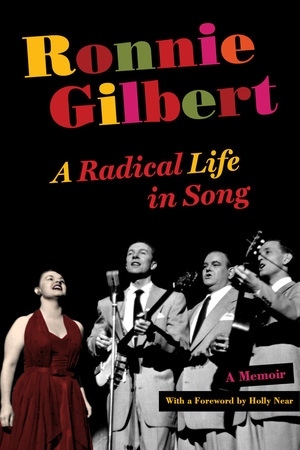 Raised in Depression-era New York City by leftist, working-class, secular Jewish parents, Gilbert is best known as a member of the Weavers, the quartet of the 1950s and '60s that survived the blacklist and helped popularize folk music in America. Her joyous contralto and vibrant stage presence enriched the celebrated group and propelled Gilbert into a second singing career with Holly Near in the 1980s and '90s. As an actor, Gilbert explored developmental theater with Joseph Chaikin and Peter Brook and wrote and performed in ensemble and solo productions across the United States and Canada. Ronnie Gilbert brings the political, artistic, and social issues of the era alive through song lyrics and personal stories, traversing sixty years of collaborations in life and art that span the folk revival, the Cold War blacklist, primal therapy, the back-to-the-land movement, and a rich, multigenerational family story. Much more than a memoir, Ronnie Gilbert is a unique and engaging historical document for readers interested in music, theater, American politics, the women’s movement, and left-wing activism. Ronnie Gilbert was a founding member of the Weavers, along with Pete Seeger, Lee Hays, and Fred Hellerman. She became a performer and an activist on behalf of social change in the late 1940s. Her credits include the book and stage presentation Face to Face with the Most Dangerous Woman in America, detailing the life and work of Mother Jones; Legacy, a play based on the writings of Studs Terkel; and many recordings with the Weavers, Holly Near, and others.